Cake Gumshoe Leandra kind of rules. 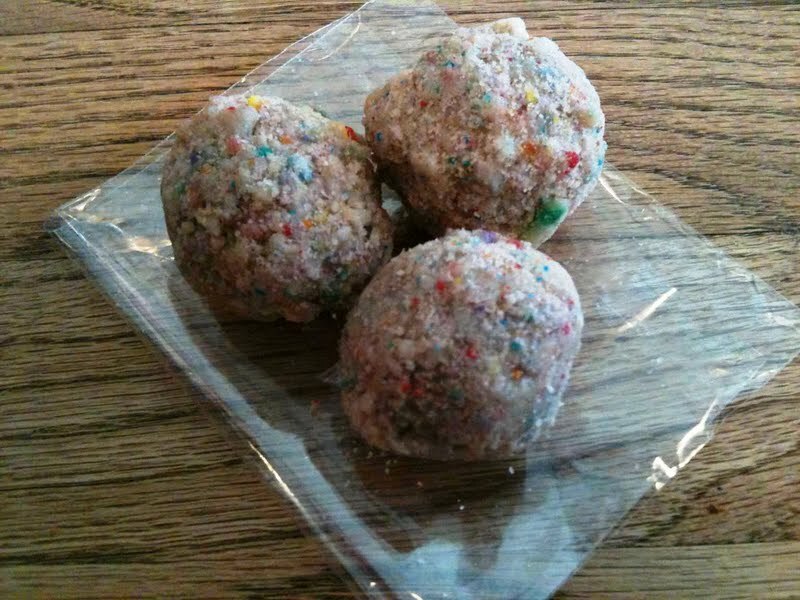 Not only is she the grande dame of NYC doughnuts, having tasted just about everything on the menu at Doughnut Plant and having tempted us all with her account of the very wonderful Peter Pan Donuts, but now, she's shared a very sweet find: Birthday Cake Truffles by Momofuku Milk Bar. Since they stopped selling slices of their cakes, they made up for it by creating "truffles" out of them. Balls of sugary dense cakey wonder packed with rainbow goodness. Now, I don't want to speak in grand generalizations, but basically, if the very thought of these doesn't make your toes curl with happiness, then you're probably a fairly joyless person. Also, their cookies are out of control! My favorite? the chocolate chip cornflake marshmallow. WOW. Of course, she included a picture to illustrate the "WOW". Want more? Learn more about Momofuku Milk Bar here; read more of Leandra's delicious adventures on her site, Snacks in the City.